Download a free fully functional 30 day trial version of Siqnal. Download free trial here. Purchase licenses for the modules that are not free. Siqnal - PDM Software is a PDM system for materials and welding management, targeted for small to medium companies within the fields of engineering, production and sales. Siqnal - PDM Software is different from other PDM systems in the ability to create and maintain high-quality quotes, orders, bills of materials, weldings, inquires and purchases, all based on strict rules and formulas. Siqnal - PDM Software is the most cost effective PDM system on the market today and is designed to support your internal business processes and optimize the resources of your employees. Siqnal - PDM Software is your next material management system, which will control your material flow end-to-end from the initial stock registration or purchase of materials, to shipment to your construction site or customer. Click an icon to get more information on the module. Siqnal - PDM Software automatically calculates consumption, weight and prices based on pcs, meters and square meters. All article types have their own custom properties, which are used for data control, documentation and efficient searching. To get started, you can download global types including properties, list of values and formulas by clicking here. You can make quotes based on articles and bills of materials. For bills of materials is it special, that you can calculate the cost of materials on the fly from the last new prices on incoming goods. Quotes can be converted to orders, and orders can be processed directly with queries, purchases and reservations in stock. Are your orders more complicated, you can transfer the orders to one or more projects and process orders with all the functionality from the module Projects. 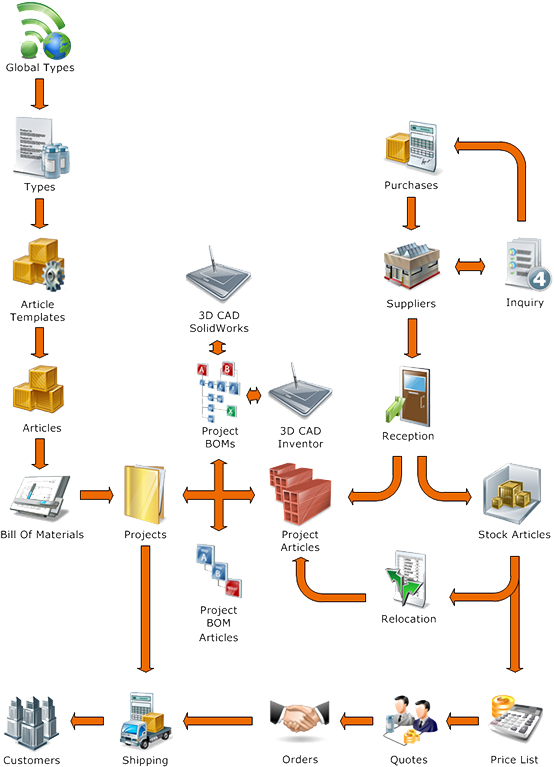 If you are using a CAD system, you can start the bill of materials management in your CAD system and work CAD based, until you are ready to purchase articles or reserve articles from stock. While the product is produced, you can create your shipping, colli and container lists and work your way through these, to pack your shipping items for the construction site or customer. You can also start the materials management by purchasing articles that have a long delivery time, to have these ready in time for the production. When you are ready to start the design phase, you can establish the mapping between bills of materials and the purchases, to ensure full tracing and professional project documentation. Siqnal - PDM Software comes with a complete printing and reporting system that include your own company name, logo and contact information. If you need a more sophisticated look on your reports, you can contact us for custom made reports. Click an icon to see a picture of the report. Siqnal is compatible with any version of Windows and can be installed as stand-alone or in a client/server environment. Click download in the menu to try a free fully functional trial version that will work without restrictions for 30 days.